Whoa-ho-ho, now you’re talking Trader Joe – a product so seemingly mad that I would never have dreamed of its existence. Pepper – and FLOWERS?!? This is already well beyond the range of even the craziest food mash ups I’ve ever heard of. I mean, we’re talking about a food mashed up with a decidedly non-food product. That I’ve got to respect. 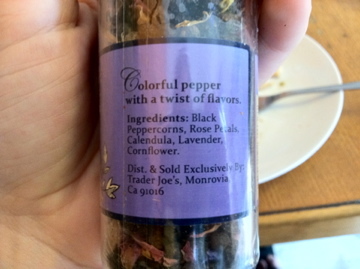 Let’s just look at the ingredients: Black Peppercorn (natch), Rose Petals, Calendula, Lavender, Cornflower. I don’t even know what calendula is. I’ll be honest; this is exactly the sort of product I go to Trader Joe’s every week hoping to find. Something so outlandish that no sane buyer could ever be expected to purchase it, yet marketed right next to the brownie mix. This is where I, Trader Joe’s Taste Tester, come in – give me the goddamn desiccated flowers, I’m ready to rock. I am amazingly slow to learn, but a few lessons have slowly crept their way into my brain over the last 28 years, and one is that product mash ups which sound like they may be terrible almost invariably are. Case in point: the Red Eye (1/2 tomato juice, ½ beer) and the Ditka Burger (peanut butter on a hamburger). I tend to assume, over and over, that these concoctions are only being sold because a gauntlet of testers have engineered the flavors to magically fuse into a symphony of taste. I have come to appreciate that this assumption may be a bit naïve, and the real source of these products are just bored gluttons and drunks. Hope springs eternal however, and the very few big wins (Salt and Vinegar?!? On a chip?!!) continue to spurn me on to self-abuse. The chicken went down plain, save for a dusting of the titular spice, and I’m happy to say the flowers seemed to dial back the more peppery part of the pepper – retaining the bite while losing the fangs, if that makes any sense. While I’m sure flower pepper can’t substitute for ordinary blackcorn pepper in every instance, there’s no real need for it to. I can easily imagine keeping a happy larder with both peppers side by side, taking on all comers. The only criticism I have is a weak one, that due to the pervasive use of floral scents in household cleaners it could be said that the pepper tastes how soap smells. There’s nothing unpleasant about it, tastewise, but the conditioning against eating cleaning products is so strong you might find you have to mentally push past it. Would I recommend it: To try, at the very least. Would I buy it again: I think I will, when I eventually run out. Final Synopsis: A rare win for Team Strange Food Mash-ups! Yeah, I love this stuff. I have eaten ‘peppery’ flowers like nasturtium in salad for many, many years so this is a genius solution. I grind it all over goat cheese toasts too, and it is exquisite. I put it in stews for an added flavor dimension and also on almost anything I top with creme fraiche (like steamed baby potatoes). I bought mine for much the same reason you bought yours, used it for the first time tonight. I put a lcouple cloves of garlic and a few leaves fresh basil in the bottom of my steamer basket, threw some haricots verts on top and let them steam up. Then I added a healthy sprinkling of flower pepper and a drizzle of balsamic. Delicious! My husband loved them enough to ask how I made them. Yep- I went to a Trader Joe’s yesterday, and the manager told me the same thing. But, there might be some hope. He said the Flower Pepper tends to be seasonal- especially at the Christmas holiday. The downer was that he said the Flower Pepper didn’t do good on it’s trial when initially sold at thye TJ stores. So…that latter aside, I am going on the prowl for it around the Christmas holiday! OH! Go to Amazon.com and add yourself to the waiting list for when it supposedly becomes avail via Amazon. There is even a gift pack of 4 diff seasoning that look delic to include the Flower Pepper. Now, the wait begins! 🙂 Cheers to Flower Power! My TJs told me to go to the website and let them know we want it back. I’ve gotten everyone in my family hooked on it and we’re all bummed out. Lola Tortola will have flower pepper soon! Wanna sell one of the reamaining two? Kidding! I wish that I had known that they were not going to carry it anymore and I would have bought all that they had- from both stores in town! 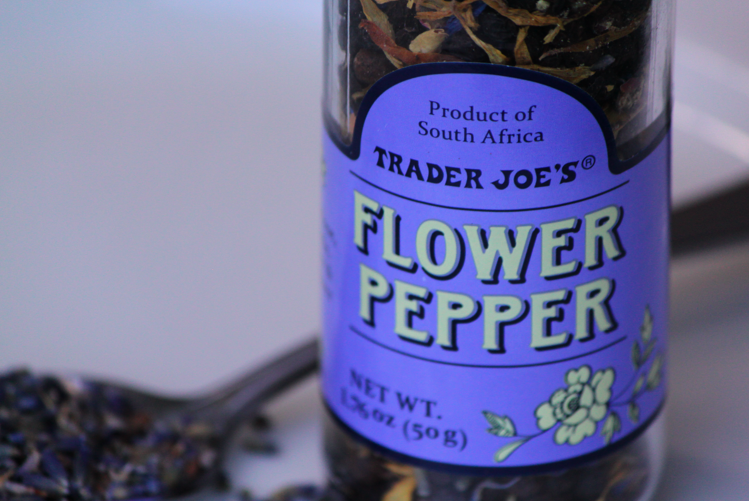 I was very unhappy to discover that Trader Joe’s discontinued the Flower Pepper as well. I confirmed it with management and tried a couple of locations to see if any was left on the shelf, but no luck. This is the second time in the recent past that TJ’s has discontinued a product that I love without notice. You would think they would announce something like this in their newsletter and give people a last time buy opportunity. I’m thoroughly disgruntled with them. none left either. I then emailed Trader Joes who told me that all stock is now gone. How could all of the stores run out of stock around the same time? You would think that some stock could be SOMEWHERE but no. Can I ask you to go to their website and make a suggestion to have it brought back? I was told that if enought people want it brought back, they will do so. It’s the best pepper ever. Do you know of any other stores that carry something sililar? “Grandma Lu’s Sichuan Seasoning,” by Grandma Lu’s avail on Amazon.com It’s not exactly the same thing as the TJ’s Flower Pepper, but close enough, and IMHO a bit better. I am with you on this. Perhaps if enough of us requested they bring it back or at least tell us their real supplier we could get it. I have complained and most of my friends and family have as well. They insist it wasn’t selling well. I think if they brought it back they would get a surprise. They didn’t carry it long enough for people to experiment and try it. Once you do, you never want anything else. Where can I get this in the uk – I love it, having tasted it recently on a visit to very kind friends in the US. Well, its quite easy to make your own flower pepper. I ordered dried organic lavender, rose, calendula and cornflower from Mt. Rose Herbs. They also have the peppercorns, I like the rainbow peppercorns. I added a bit of Lemon Thyme because I like lemon flavor. Mix it up, put it in your own grinder and grind away on your favorite salad, vegetables, fish & chicken. I keep one on the table, another in the kitchen. Just found out this is no longer sold. I am devastated. This has been my absolute favorite pepper, a staple in my kitchen, an important ingredient in my salad dressing.. used *everywhere* I needed pepper. Please, please please, TJ’s, bring this back! I would to to their website and request that they bring it back- that’s what I did. If enought people do this, then maybe they will bring it back. We can only hope! I’m still not over it!! Folks, I discovered the recipe for Flower Pepper and Flower Salt and now make it myself. Recipe for a condiment formerly sold by Trader Joe’s. For the Flower Salt – change the peppercorns to 1 cup each of Sea Salt and Pink Himalayan Salt crystals and use the same flowers. I make large batches of this pepper and salt and store it in the freezer. Bottling some up in a grinder makes wonderful hostess gifts when you go visiting for dinner at a friend’s home. Debbie – yes, the link is for an American supplier. They are really quick to ship and prices are very reasonable. If anyone is interested the glass grinder top bottles are available at http://www.sks-bottle.com/340c/fin4c.html and they are made in USA! I just order some and plan to make the flower pepper and flower salt for gifts. Thanks for this Eat At Joes info. Thanks for the link to the grinders. I had been looking for an inexpensive bulk supplier. Muc appreciated. Another place to get the organic dried flowers to make Flower Pepper is Mountain Rose Herbs.com. Good prices, prompt service. It’s always great to have a second source and this site has a huge selection of culinary herbs, flowers, and spices. Thanks for the recommendation Emmy. Trader Joe’s doesn’t have this product any more. I tried to buy it today. Bummer. Please scroll up on this feed. I put the recipe to make the flower pepper yourself. It’s really quite simple and a batch will last all year. Loved it in the past , can’t find it anywhere . Seems it was discontinued in 2012 . Someone just put it on Amazon for $1500.00 for 2 of them – a wee bit out of my price range . Please let me know if it’s still available at a more reasonable price . I have been maknug it and selling the same thing for a few years at Farmers Markets. I would be happy give you more information.